CAPCITO IS ABOUT MINIMISING THE BUMPS IN THE ROAD AHEAD WHEN GROWING YOUR BUSINESS. With Capcito, we aim to channel more funds to small and medium sized companies who actually need them, all around the world. Starting point is Sweden. HOW ARE WE DIFFERENT AND BETTER? By using advanced technology with an automated process a new client can be reviewed and provided with an offer within seconds. Through a big data approach, combined with a new form of invoice financing, an extremely flexible and convenient financing product is within reach to companies. Whether it would be for adding financial strength for growth or running the day to day business. Capcito aims to be your tap for funding, to be turned on and off when preferred. 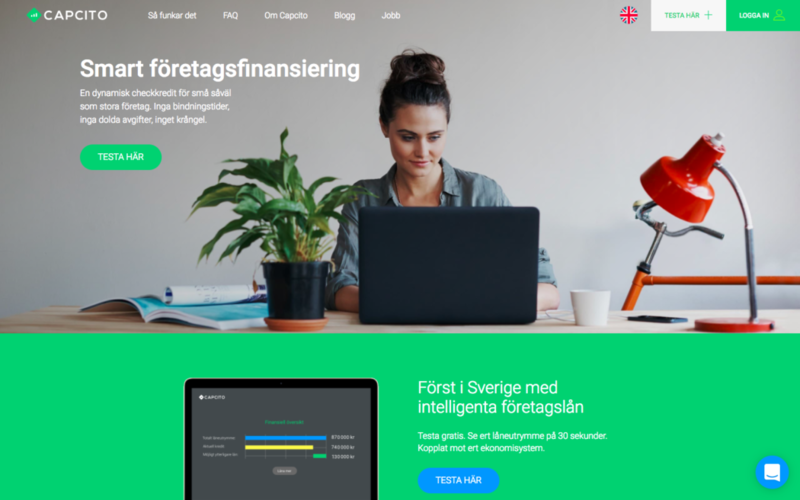 Capcito takes invoice financing to the next level, starting in Sweden. Entirely online, and integrated with the major cloud based accounting platforms, Capcito enables companies to borrow money to fuel growth or other operational needs, using their invoices as securities. Enrolling takes just a couple of minutes, and the loan is paid out in less than 24 hours – also for new customers. Backed by SEB Venture Capital, Collector Ventures and Galjaden Fastigheter AB. 2014, Capcito.com opened on December 4th, 2015.